Referred to by Mahathma Gandhi, as the ‘Evergreen City of India’ Thiruvananthapuram, also known as Trivandrum is the capital of State of Kerala, the ‘Gods Own country’. It is located on the west coast of India near the extreme south of main land spreading over a total of 2192 Sq.km. It is the largest and most populated city in Kerala. The District Judiciary of the district consist of one Principal District and Sessions Court, eight Addl. District and Sessions Courts, six Subordinate Judges/Asst. Sessions Courts, three Motor Accident Claims Tribunals and four Addl. MACTs, three Family Courts, a Co-Operative Tribunal, a Tribunal for Local Self Government Institutions, an Enquiry Commission and a Special Judge under the Prevention of Corruption Act, one special court (CBI), one Chief Judicial Magistrate Court, one Addl. Chief Judicial Magistrate Court, fifteen Judicial Fist Class Magistrate Courts, nine Munsiff’s Courts, one Rent Control Court and one Gram Nyayalaya. These courts are spread over at Thiruvananthapuram, Neyyattinkara, Nedumangadu, Attingal, Varkala, Kattakkada and Parassala. The District Courts and other Subordinate Courts of Thiruvananthapuram City are housed in the Court complex at Vanchiyoor which is an impressive and English-Gothic designed building constructed by His Highness Sree Moolam Thirunal Rama Varma. 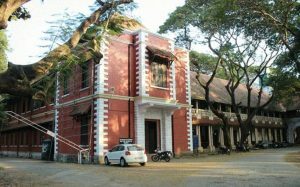 A Bench of the Travancore Kochin High Court was earlier housed in this picturesque building after independence, till it was abolished and shifted to Kochin where the High Court of Kerala is located consequent to reorganization of States. Thereafter, the District Court and Subordinate Courts at Thiruvananthapuram are being functioning in this magnificent complex. To improve the working atmosphere provided to the Judicial Officers, litigant public, staff and advocates recently a new Court complex was constructed in the Vanchiyoor Court premises and the Motor Accident Claims Tribunal Thiruvananthapuram, the Family court, Thiruvananthapuram, University Appellate Tribunal, Enquiry Commission and Spl. Judge under the Prevention of Corruption Act, CBI Court and seven Magistrate Courts in Thiruvananthapuram were shifted to the said building. There are also other Court complexes at Neyyattinkara, Nedumangadu, Attingal, Varkala and Kattakada where respective Subordinate Courts in the District are functioning. The District Judiciary is headed by the District and Sessions Judge.